The general options allow you to setup various aspects to your product that make it unique and customizable. Show on Main Store Page – This product will appear on the main store page. These could also be considered ‘Featured’ products. Include in Specials Widget – This product will appear in the sidebar widget for EasyCart should you utilize this widget. Refer to wordpress for installing and setting up widgets. Learn more by Clicking Here. Allow Customer Reviews – If enabled, your store will display the 5 star rating along with a new tab next to the description. 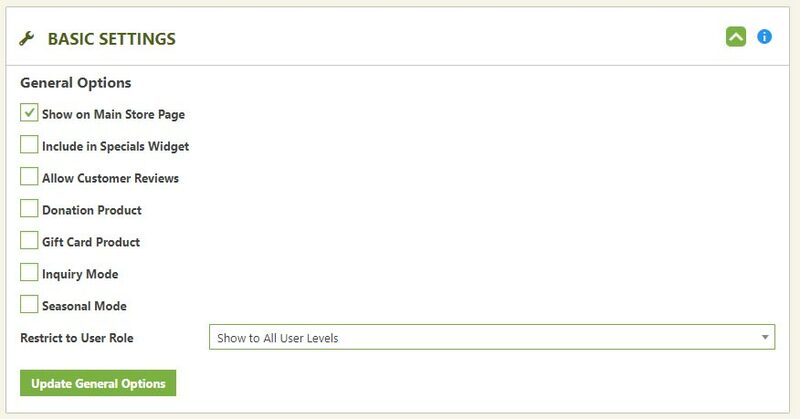 This allows users to leave a comment, rating, and will appear in your reviews administration area for review and submission. Click Here to learn more about the review management system. Donation Product – If selected, the price of the product becomes editable to the user. Great for donations, where a customer can enter a price they wish to donate. We also use this to create an invoice payment product. A ‘Make-A-Payment’ product is a great way to allow customers to pay a bill they owe regardless of the amount. The language editor in EasyCart allows you to customize language for this type of product layout as well. Gift Card Product – If set, the purchase of this product will product a unique 12 digit code the user can enter at checkout to redeem on your website. Gift Cards allow the user to enter a To, From, and Message as well as an email to send to the customer. This makes for an automated system that sends out gift cards and allows redemption all from your site with little interaction. Click Here to learn more about managing gift cards. Inquiry Mode – This option replaces the traditional ‘Add to Cart’ button with an ‘Inquiry’ button. Users can then ask questions about a product rather than purchase. Seasonal Mode – This option will replace the traditional ‘Add to Cart’ button with a ‘Coming Soon’ button. You can even specify an expected date or message such as ‘Available this Summer’ on your product. Restrict to User Role: There is the ability to build user roles within ‘User Accounts’ and then edit each product and assign to a specific user role in this location.